Recently, elite woman Australian cyclist Carlee Taylor demonstrates that women race just like the men (minus ubiquitous doping1)—unfortunately, the camera did not stick around to record her unbelievably determined race reentry. UPDATED 09/14/2015 WC, The bicycling big book of cycling for beginners : everything a new cyclist needs to know to gear up and start riding (Preview) An easy to read book for women (and men) just beginning their foray into cycling. UPDATED 12/22/2018 UCI, 2019 UCI WOMEN'S WORLDTOUR, Road and (just in case you want to watch and ride) Canyon, Endurace WMN CF SL DISC 7.0 and GCN, Shimano 105 Vs Shimano Dura-Ace | What's The Difference? and GCN, Road Bike Geometry Explained – How To Understand Reach, Stack, Trail & More! What a Year of Racing! 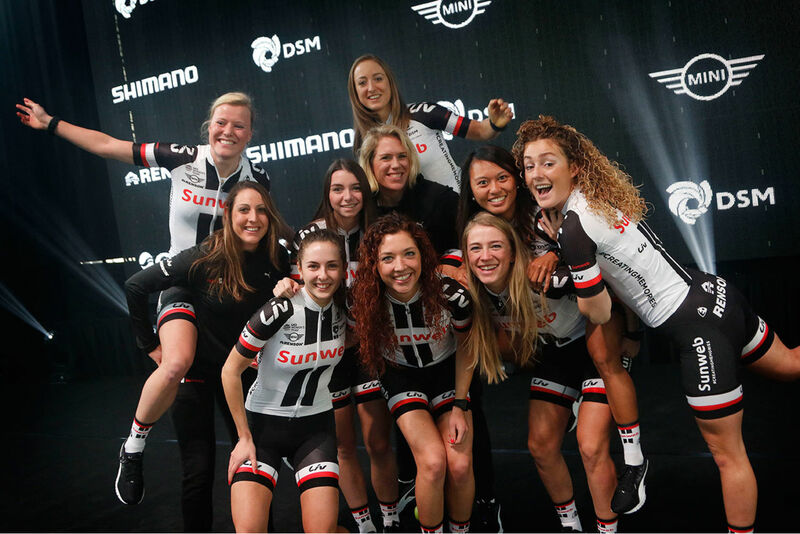 Kudos to the Sunweb organization and its 2018 women, men, and development squads for their determined efforts to "up their game" and leave professional cycling better than they found it. Ashleigh Moolman-Pasio describes her mental and physical determination to recover from her latest major cycling injury. UCI Women's WorldTour peloton should begin publishing racers' real-time performance and imaging data. Currently 10 women are competing for three training slots at the Canyon-Sram 2017 Team training camp in Mallorca, Spain (Majorca for the English riders). One of the three finalists will then be selected to race with the Canyon-Sram 2017 (11th member), a tour de force in women's team time trial! Pirouetting on the front wheel is a skill best performed by an elite trials cyclist, not an elite road cyclist during a 45-50 mph descent! Kudos to the ASO for sending the elite women's peloton up the alps. UPDATED 05/12/2017 UCI Women's World Tour, Amgen Tour California 2017 Microsoft Tracker with Stage Replay; TV, Web and Mobile Coverage Schedule Kudos to Boels–Dolmans and women's peloton for providing the beautiful on-board cycling-cam images of the stage 1 finish. It's not often we get a close view of one Road World Champion (Anna van der Breggen) towing another Road World Champion (Megan Guarnier) to the finish line! World Champion Armitstead and World Time-Trial Champion van Dijk team up and pull the National Champion Majerus to a stage win—pretty classy! Commentators Sarah and Hugh do a great job of informing this year's Aviva Women's Tour and decidedly more difficult and exciting racing. 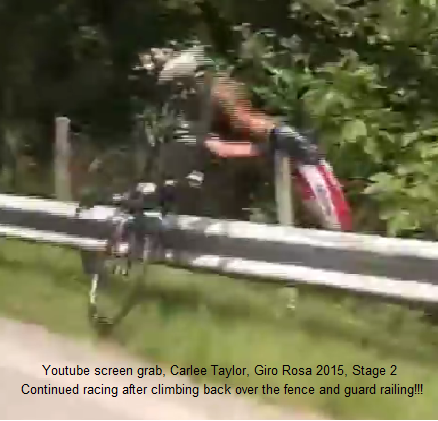 UPDATED 07/29/2015 Vera Koedooder on bike camera La Course 2015 - by Vera Koedooder Great footage from a fantastic rider's on board camera. Clearly the tire, rain, and cobble configuration was causing some problems for several racers? Felt Development, FSA, and HED team up to design an asymmetric track cycling frame (TA-FRD), which has been optimized for the Rio 2016 women's team pursuit track cycling team. What a fantastic video and moment for women's elite cycling! Marianne Vos and Emma Johannes are beginning to mentor the younger women riders and racers, which will significantly benefit formative women's cycling. Kudos to USADA! Usage of TUES are temporary "short duration" exception to a strict goal of no doping in competitive cycling, not a permanent or routine competitive tool. UPDATED 12/05/2017 NYT, Russia Banned from Winter Olympic by I.O.C. UPDATED 01/31/2017 60Minutes, Hidden magnets — the next big cheat in cycling? Can UCI President, Brian Cookson end chemical and mechanical doping in the professional men's peloton without ending men's professional cycling? Cookson's dilemma is that professional men's cycling may decline or end with and without chemical and mechanical doping, which may explain Cookson's approach of pursuing doping, but not too aggressively! Can the impressive professional women's peloton avoid Cookson's dilemma as its sponsorships and fan base continue a dramatic ascent? UPDATED 09/15/2016 Velo, WADA hack no big deal for Froome and Wiggins WADA has augmented a cycling (and other sports) doping problem with an abusive "TUEs" (Therapeutic Use Exemption) problems. A leading professional cyclist, especially one wearing the magical rainbow jersey who provides a pattern or series of jeremiad instead of randomly drawn blood and urine samples through the "whereabouts system" should expect a lot of skepticism. LiveScience, The 'Doping Arms Race': How Athletes Evade Testing As the costs decrease and automated screening efficiency using large micro-arrays increases the imaginations of cheating athletes, coaches, and boutique chemists will begin to lag. When coupled with certain, credible, and effective career ending suspensions from competition the short-term appeal to use unauthorized (i.e. noncompetitive) performance enhancing methods will begin to lag, too. UPDATED 08/02/2016 VeloNews, Lizzie, we need answers [...and fast] How does a domestic federation clear an elite cyclist that misses four three "out of competition" drug tests? ..not to mention preserving the sport of elite cycling...cyclists bans, exemptions, and performances across time will be more meaningful than press announcements. UPDATED 04/18/2016 CyclingNews, Bugno calls on UCI to use heat cameras to detect mechanical doping It's encouraging that the doping debate is shifting to effective and efficient methods for preventing mechanical doping. Is the biological-passport (aka b-passport) growing accuracy and precision causing the shift? It's astonishing that a sports MD would say a drug, which increases blood flows and hence oxygen is not performance enhancing. Such statements buttress the argument against team or private doctors for professional and elite cyclists—every rider uses a trained and certified doctor from the peloton pool. Heightened awareness of peloton doping, biological passports, team or individuals’ doctor's notes, or national lab countermand tests are not substitutes for independent routine, rigorous drug testing and permanent peloton disqualification of all doped racer. UPDATED 11/18/2015 Atlantic, Can Russia Clean Up in Time for the Olympics? Don't forget the doctors! Training regimens for serious amateur and professional cyclists requires input and oversight from competent sports doctors to minimize the possibility of cyclists' injury. However, this does not mean every amateur and pro team or individual riders require their own personal sports doctor. UPDATED 11/13/2015 VeloNews, Cookson: We couldn’t run pro cycling without dopers Fine, let the men's pro-cycling peloton completely implode, if necessary to clear the ubiquitous doping and dopers! UCI can focus its resources on building a clean women's peloton. We'll see if the women's pro-cycling peloton can exist and thrive without the doping, dopers and their indispensable (some might say indefensible) doctors? The Independent Commission (IC) is created by decision of the World Anti-Doping Agency (WADA) President following allegations of doping aired between 3rd and 8th December 2014 by the German television channel ARD.